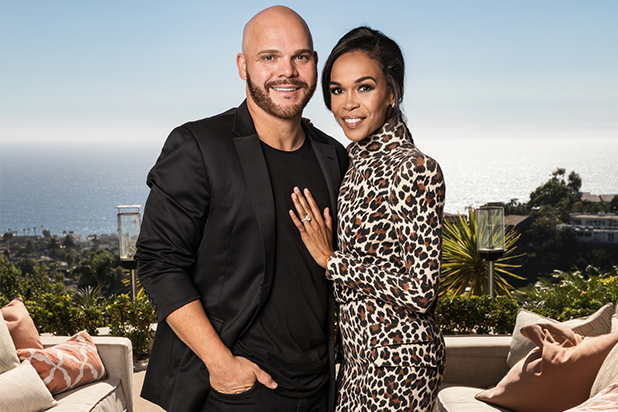 Four new unscripted series are headed to OWN’s Saturday night lineup, the network announced Thursday, including “Chad Loves Michelle,” a reality show following Destiny’s Child singer Michelle Williams’ engagement to pastor Chad Johnson, which will premiere in November. “Ready to Love” is a dating show featuring black men and women in their 30s and 40s, hosted by Thomas “Nephew Tommy” Miles, that will kick off with a two-night premiere in October. The other two series, “Family or Fiancé” and “Rocket City Revival” are expected to premiere next year. See each series’ official description and premiere dates below. “Chad Loves Michelle,” from Relevé Entertainment and InventTV, will feature an honest inside look at the path to marriage between Grammy award-winning singer Michelle Williams, one-third of chart-topping Destiny’s Child, and Chad Johnson, sports chaplain to professional sports organizations. Having been together for a year and never in the same city for more than seven days, the newly engaged couple is turning to intensive pre-marital counseling to help prepare them for life together as husband and wife. Both are relocating to Los Angeles from different cities in the months leading up to their wedding, but not to the same bedroom. Guided by their faith and unwavering values, the couple has vowed to consummate the relationship only after they are wed. Each episode will feature real issues the couple is tackling in their everyday lives, including Michelle’s high-profile battle with mental health issues, and the lessons they learn from the pre-marital counseling sessions that bond them stronger together. Sergio Alfaro, Michaline Babich, Holly Carter, Michelle Williams and Chad Johnson are executive producers. In “Family or Fiancé,” from Bunim/Murray Productions, newly engaged couples whose families have voiced paralyzing concerns (both real and imagined) over their proposed marriage, will bring their families to live together under the same roof. The stakes have never been higher as they take on activities designed to strengthen their bond, unpack their differences, and show the betrothed couple in a whole new light. Will the week of experimental “family time” confirm their families’ concerns and lead to a breakup? Will the families discover enough common ground to give their blessings? If all else fails, how will the couple face the future knowing that their families may never accept their partner? Executive producers are Gil Goldschein, Julie Pizzi, Jonathan Murray and co-executive producer Erica Ross. “Rocket City Revival,” from Kingdom Reign Entertainment, brings together three high-powered African-American couples who have returned to Huntsville, Alabama (nicknamed “The Rocket City” for its close association with NASA and U.S. space missions) to help revitalize the region through their joint real estate venture. The couples are long-time friends and avid socialites who all have their own personalities, strong points of view, and individual strategies for wanting to make this huge undertaking a success. We’ll see if they can succeed at mixing business with pleasure for all the right reasons, or if the cutthroat industry makes foes of the longtime friends. Rocket City Revival is produced by Kingdom Reign Entertainment for ITV America. Carlos King, Gil Lopez and Andrew Hoagland are executive producers. For being such a larger than life figure, Oprah Winfrey has gravitated as an actress toward playing more modest women of an ordinary stature. Winfrey is so celebrated as a media personality, she doesn't often get the credit for her versatility, strength and naturalism on screen. That might be in part because, outside of some TV movies for Oxygen and animated voice work, she's limited her projects and only acted in a handful of notable films. Here's how they stack up from worst to best. In this forgettable adaptation of an otherwise powerful novel by Richard Wright, Winfrey plays the mother to Bigger Thomas. She goes from stern and strong-willed as she urges her son to find work to warm and desperate once she's pleading for her son's life. This is an early performance for Winfrey, and she'd find more presence in better projects later. Winfrey never plays herself in the movies. And yet in Disney's "A Wrinkle in Time," she's literally larger than life, appearing as a giant in the sky dressed in chain mail and a massive blonde pillow of hair spewing Oprah-isms. But Ava DuVernay doesn't cast her to play a charismatic goddess. Instead, she's there to do what Oprah does best. She brings hope, spirit and positivity to the film, and when she's talking to the film's main character, she has a gift of sounding as though she's talking directly to you. Winfrey gave her all for the adaptation of Toni Morrison's "Beloved," showing sadness and anger in equal measure on screen. She even went method and simulated the experience of being a slave in preparation. But the film was a sprawling and overlong epic as handled by Jonathan Demme, and the its failure at the box office sent Winfrey into a "depression." Winfrey plays a small but significant role in Ava DuVernay's civil rights drama "Selma." In a powerful scene that isn't tantamount to the plot but is crucial to the movie's punishing fight for justice, Winfrey attempts to register to vote in Alabama and comes face to face with a ruthless clerk trying to find any reason to deny her the right to vote. She quietly and just barely holds her head up to recite the Preamble of the Constitution and prove her civil knowledge. But it's devastating to see someone even like Winfrey humbled by pervasive racism. In this HBO movie, Winfrey plays a woman searching for a mother she never knew. Henrietta Lacks was the unwitting donor of a tissue sample that was eventually used as a cure for polio and countless other medical advances. But after years of lies and cover ups from the medical community, the Lacks family has grown untrusting and paranoid. Winfrey plays Henrietta Lacks' daughter as unpredictable and volatile, and her performance anchors a movie about how an African-American woman battling her own paranoia comes to terms with her heritage and family's legacy. In "The Butler," Winfrey walks a fine line between sweet and motherly -- and even unlikable. She's cheating on her upstanding husband and struggles with drink, but she's still a sage figure in this family's household. She has an incredible scene as she's talking about Sidney Poitier, playing polite until her son insults the dignity of his own father. It's the type of performance where Winfrey is convincing enough playing nice that you're surprised when she reveals she's not a pushover. In what is her finest work by a mile, Steven Spielberg got a hold of Winfrey just before she was "Oprah." She's introduced as a "big girl", and on screen she's a loud and proud woman with vitality, charisma and fearless confidence. Looking at her, you know she'll be a star, but she's so boisterous and defiant, you'd hardly expect her to become the warmest, most understanding media personality of the next 30 years. Her early line about fighting her whole life earned her an Oscar nomination, but I feel more sorry for the woman who slapped Oprah in the film and lived to tell the tale. 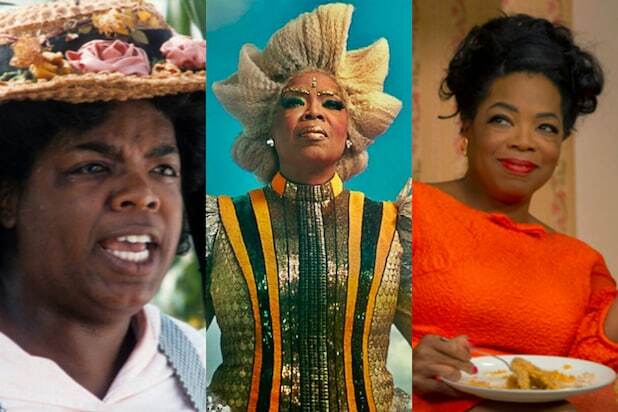 Where does Oprah’s larger than life role in “A Wrinkle in Time” rank?